"Come here, Rosel, " one nurse co-worker grabbed my attention. She was seeing a young man whose left foot was all red on the sole and around the ankle. Sitting on the beige plastic chairs, he crossed over his left leg over the right, to prevent his left foot from touching the floor. He would grimace in pain every time. A visible wound on the back of the ankle was swollen and all around it and on the sole of that foot was very red. The infection must have been there prior to his arrest as he was just booked that same day he requested to be seen by the medical staff. "What's the perfect diagnosis for this? " asked my co-worker. Ignoring her question, I started delving more to what had caused that massive infected wound. "Where did that wound come from, Sir? ", I asked. Man: "I don't know. If I knew, I would tell you!" [speaking in an angry tone of voice and he gave me that look like I just asked him a stupid question]. Keeping my patience and calmness despite the disrectful behavior given to me, I asked further, "Sir, I noticed that you also have a lot of scratches on your left calf and shin, did you hit something or have you gotten into some kind of accident?" Man: gave me another nasty, "trying to scare me" kind of stare, "Didn't I just tell you that I don't know? Well, wait! Yeah, I ran and hid into some bushes and killed two people. I got out and got these scratches to kill some more. Like that answer?" "Sir, if you think you can scare me with the way you responded with my question, you're wrong. I don't want to tell you what can happen if you're very disrespectful to any staff here because you will definitely tremble. I've been trying to ask you a lot of what seem to be stupid with you kind of questions, but to us, medical staff, your answers would truly help us in evaluating your infected left foot accurately and so, we can treat it with the best option to stop this infection. If you don't want to help me out, that's fine. But if you end up losing your left foot, don't blame us." We are not here to find out why you're incarcerated. We are here to address any medical problems. I don't know what you've gone through, but one thing is for sure, we didn't cause any of your troubles." As soon as I finished speaking, the deputy started yelling at the inmate who tried to fight with the deputy. When he looked back at me, this time, he was the one who looked afraid and embarassed. He couldn't look me straight in the eye. He started cooperating with my co-worker who was initially seeing him. "Cellulitis! It's cellulitis!," I told my co-worker. "Just have our doctor see him when he comes in a few hours so he can give this man some antibiotics." The man said "thank you" to my co-worker. He passed by the door and saw me in front of the computer. I was finishing a doctor's order. He bowed his head down and started walking away, limping a bit and still grimacing whenever his left foot touched the floor. He knew that he didn't terrify me at all! But he left with a different attitude, one that was more submissive to authority. He knew I have the big deputy to protect me. But what he didn't know, I have a "Protector" Who is there with me all the time. That was the reason why he would not terrify me! 1 Peter 5:8 -"Be self-controlled and alert. Your enemy the devil prowls around like a roaring lion looking for someone to devour." Psalm 3:3 -"But you are a shield around me, O LORD; you bestow glory on me and lift up my head." Romans 8:31 -"If God is for us, who can be against us?" Ephesians 6:10-17 -"Finally, let the mighty strength of the Lord make you strong. Put on all the armor that God gives, so you can defend yourself against the devil's tricks. We are not fighting against humans. We are fighting against forces and authorities and against rulers of darkness and powers in the spiritual world. So put on all the armor that God gives. Then when that evil day comes, you will be able to defend yourself. And when the battle is over, you will still be standing firm. Be ready! Let the truth be like a belt around your waist, and let God's justice protect you like armor. Your desire to tell the good news about peace should be like shoes on your feet. 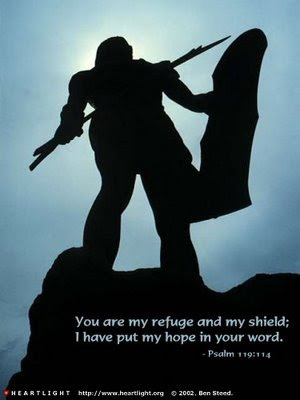 Let your faith be like a shield, and you will be able to stop all the flaming arrows of the evil one. Let God's saving power be like a helmet, and for a sword use God's message that comes from the Spirit. "